Poly is a High Density Polyethylene (HDPE), a recyclable plastic derived from post-consumer waste such as milk & detergent bottles. This material is cleaned in a decontamination process to a purity level of over 99% HDPE, then compounded into solid board stock material. The resulting product contains over 90% recycled post consumer waste by weight. Poly is High Density Polyethylene (HDPE), a recyclable plastic derived from post-consumer waste such as milk and detergent bottles. This material is cleaned in a decontamination process to a purity level of over 99% HDPE, then compounded into solid board stock material. The resulting product contains over 90% recycled post-consumer water by weight. Poly has exceptional resistance to moisture, fading, insects, splintering, warping and other hazards of environmental exposure common to wood or wood fiber composite materials. High color stability UV pigment systems which minimize material breakdown from prolonged sun & weather exposure. Requires no waterproofing, staining, or other similar recurring maintenance other than an occasional washing with soap & water. Luxcraft's craftsman don't cut corners when it comes to building furniture. They reinforce their swings, gliders and benches with aluminum angle braces. Poly glider arms are used for a stronger, smoother glider, and they make their own heavy-duty swivels. All Luxcraft products are assembled with 316 grade stainless steel hardware for optimum durability. Stainless steel is corrosion and stain resistant, which ensures its brilliant shine will last for years to come with very little maintenance. Luxcraft products are made right here in America (Ohio to be exact) by skilled craftsmen in their 56,000 square foot shop. Each product is hand-crafted and inspected before its allowed to leave the shop. 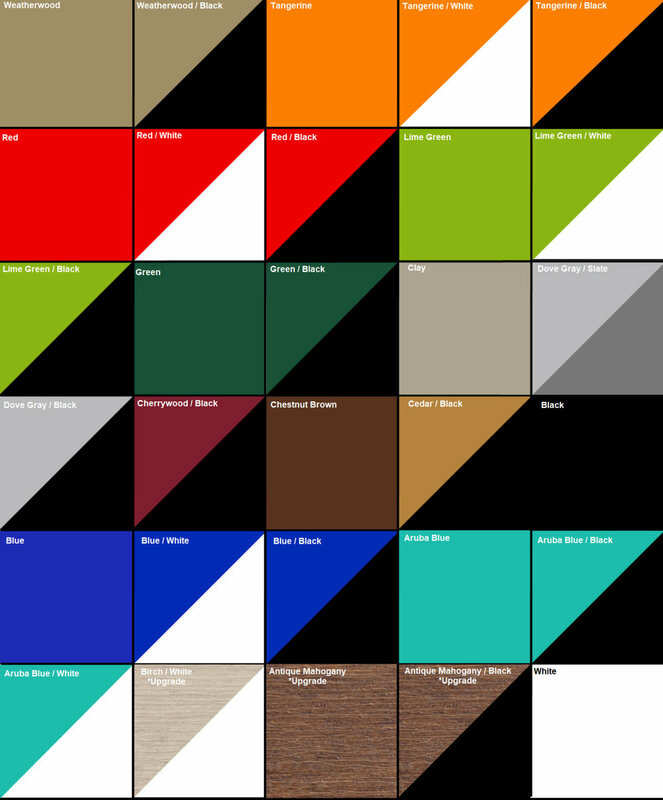 Poly Lumber has a wide variety of color options. Please view all of the available colors below! There is a up charge for NON-STOCK colors. Clean with Luxcraft Poly Brite cleaner and rinse with warm water, monthly (some colors such as white require more frequent cleaning). For certain stains it may be necessary to scrub with a soft bristle brush. Fasteners are 316 grade stainless and, although this is a premium grade stainless, it is still susceptible to corrosion in extreme conditions (coastal areas with continuous exposure to salt water). In those conditions it is recommended to rinse the furniture weekly with fresh water and wipe the hardware with a soft cloth. Do not place hot items on furniture as this could potentially melt the material. Certain flower pots or containers left on the furniture over an extended period of time could cause staining. By following these simple steps you will enjoy the beauty and comfort of your Luxcraft Outdoor Furniture for a lifetime. Poly Brite cleaner is formulated for use on LuxCraft™ poly furniture. After extensive research and testing we now offer a product that removes dirt and grime with minimal effort. It is environmentally friendly and contains no harsh chemicals. We’re pleased to offer cushions and umbrellas featuring fabric from Sunbrella, a leading supplier of fabric for outdoor use. The high quality materials are specially manufactured to be able to withstand the elements. Stop in store to check out our fabric selection! 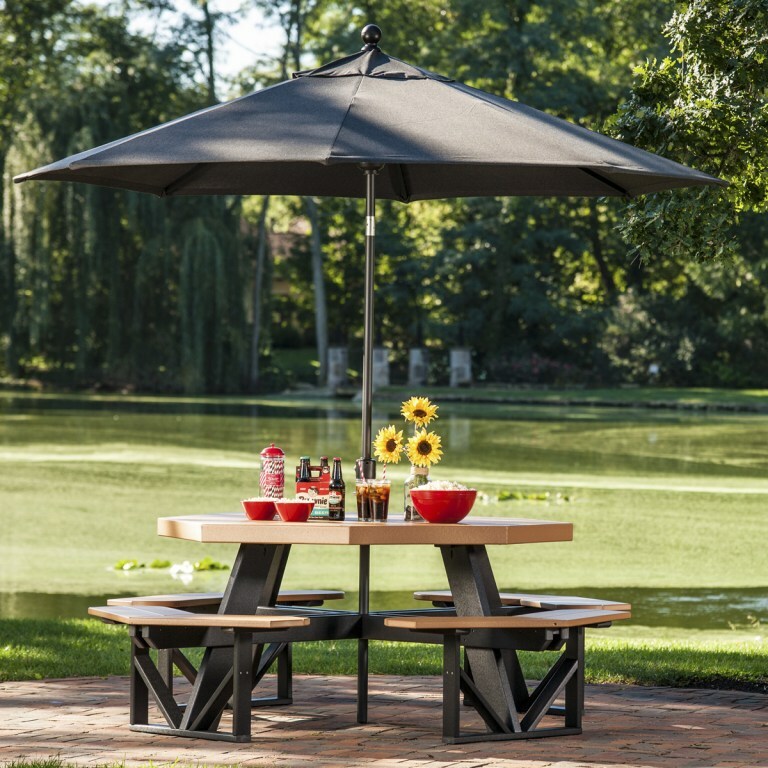 Comprised of an aluminum Treasure Garden frame and Sunbrella fabric, this umbrella is extremely durable as well as beautiful. Umbrella head tilts with the push of a button for shade that moves with the sun.